BENGHAZI, Libya - Libya's rebels will agree to a cease-fire if Muammar Qaddafi pulls his military forces out of cities and allows peaceful protests against his regime, an opposition leader said Friday as rebels showed signs that their front-line organization is improving. Mustafa Abdul-Jalil, head of the opposition's interim governing council based in Benghazi, spoke during a joint press conference with U.N. envoy Abdelilah Al-Khatib. After meeting government officials in Thursday, Al-Khatib was visiting the rebels' de facto stronghold of Benghazi in hopes of reaching a political solution to the crisis embroiling the North African nation. Abdul-Jalil said the rebels' condition for a cease-fire is "that the Qaddafi brigades and forces withdraw from inside and outside Libyan cities to give freedom to the Libyan people to choose and the world will see that they will choose freedom." The U.N. resolution that authorized international airstrikes against Libya called for Qaddafi and the rebels to end hostilities. Qaddafi announced a cease-fire immediately but has shown no sign of heeding it. 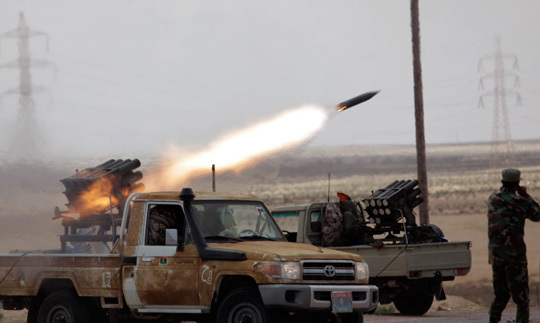 His forces continue to attack rebels in the east, where the opposition in strongest, and have besieged the only major rebel-held city in the west, Misrata. The city has been shelled by tanks and artillery for days, said a doctor in a Misrata hospital who spoke on condition of anonymity out of fear of reprisals. Many people have been killed, including eight since Thursday, he said. He said Qaddafi brigades control the port and a main street, but rebels control the heart of the city. Abdul-Jalil said the regime must withdraw its forces and lift all sieges. He stressed the ultimate goal was Qaddafi's ouster. The U.N. said Al-Khatib arrived Thursday in Tripoli. Forces loyal to Libya's leader of nearly 42 years spent much of this week pushing the rebels back about 100 miles along the coast. On Friday, the opposition showed signs of gaining discipline on what has often been a disorganized battlefield. Fighters said fresh forces were coming in, mostly ex-military, but also volunteers with not quite a month of training. The rebels also appeared to have more communication equipment such as radios and satellite phones, and were working in more organized units, in which military defectors were each leading six or seven volunteers. The untrained masses who have rushed in and out of the fight for weeks with no apparent organization were barred from the front line. They stayed to the rear, to hold the line temporarily in case Qaddafi's forces attempt to flank the rebels. "The problem with the young untrained guys is they'll weaken us at the front, so we're trying to use them as a backup force," said Mohammed Majah, 33, a former sergeant. "They have great enthusiasm, but that's not enough now." Majah said the only people at the front now are former soldiers, "experienced guys who have been in reserves, and about 20 percent are young revolutionaries who have been in training and are in organized units." The rebels also had mortars Friday, weapons they previously appeared to have lacked, and on Thursday night they drove in a convoy with at least eight rocket launchers -- more artillery than usual. The rebels' losses this week, and others before airstrikes began March 19, underlined that their equipment, training and organization were far inferior to those of Qaddafi's forces. The recent changes appear to be an attempt to correct, or at least ease, the imbalance. U.S. Adm. Mike Mullen, chairman of the Joint Chiefs of Staff, revealed Thursday that a major factor in Qaddafi's ability to drive back the rebels -- essentially eliminating the territorial gains they had made last week with the help of international air strikes -- was bad weather. He said it grounded most combat missions earlier this week. Mullen appeared before Congress with Defense Secretary Robert Gates, who revealed that the Pentagon is about to pull its attack planes out of the international air campaign in Libya, hoping NATO partners can pick up the slack. The announcement drew incredulous reactions from some in Congress who wondered aloud why the Obama administration would bow out of a key element of the strategy for protecting Libyan civilians and crippling Qaddafi's army. Gates said no one should be surprised by the U.S. combat air pullback, but he called the timing "unfortunate" in light of Qaddafi's battlefield gains. He noted that the air attacks are a central feature of the overall military strategy; over time they could degrade Qaddafi's firepower to a point that he would be unable to put down a renewed uprising by opposition forces, he said. Mullen and Gates stressed that even though powerful combat aircraft like the side-firing AC-130 gunship and the A-10 Thunderbolt, used for close air support of friendly ground forces, will stop flying after Saturday, they will be on standby. Mullen said this means that if the rebels' situation becomes "dire enough," NATO's top commander could request help from the U.S. aircraft. Gates: U.S. lacks "visibility into rebels"
It was not immediately clear where the front line was on Friday. On Thursday, the opposition had moved into Brega, about 50 miles east of Ajdabiya, before Qaddafi's forces pushed them out. Qaddafi's greatest losses this week were not military but political. Two members of his inner circle, including his foreign minister, abandoned him Wednesday and Thursday, setting off speculation about other officials who may be next. The defections could sway people who have stuck with Qaddafi despite the uprising that began Feb. 15 and the international airstrikes aimed at keeping the autocrat from attacking his own people. Libyan state TV aired a phone interview with intelligence chief Bouzeid Dorda to knock down rumors that he also left Qaddafi. "I am in Libya and will remain here steadfast in the same camp of the revolution despite everything," Dorda said. "I never thought to cross the borders or violate commitment to the people, the revolution and the leader." Qaddafi struck a defiant stance in a statement Thursday, saying he's not the one who should go -- it's the Western leaders who attacking his military with airstrikes who should resign immediately. Qaddafi's message was undercut by its delivery -- a scroll across the bottom of state TV as he remained out of sight. The White House said the strongman's inner circle was clearly crumbling with the loss of Foreign Minister Moussa Koussa, who flew from Tunisia to England on Wednesday. Koussa is privy to all the inner workings of the regime, so his departure could open the door for some hard intelligence, though Britain refused to offer him immunity from prosecution. Ali Abdessalam Treki, a former foreign minister and U.N. General Assembly president, announced his departure on several opposition websites the next day, saying "It is our nation's right to live in freedom and democracy and enjoy a good life." Qaddafi accused the leaders of the countries attacking his forces of being "affected by power madness." "The solution for this problem is that they resign immediately and their peoples find alternatives to them," the Libya state news agency quoted him as saying.